We are an IT services company specializing in medical software solutions and related services. 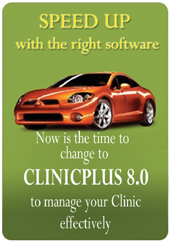 To-date we have more then 300 clinics in klangvalley area using our clinical management software and maintenance services. Not equipped with PCs or PCs/Operating System of the recommended specifications. Not equipped with broadband access. No technical expertise to connect the existing PCs to the internet or setting up routers for internet sharing. Regular virus, adwares, spywares and unwanted pop ups, restricting the availability of PC and internet services. No one-site training on usage of on-line claims submission. Supply of PCs and related hardware , installing operating system and browser of the recommended specification. Assist clinics in applying for broadband services. Assist clinics in networking and related hardware configuration. Assist clinics in setting up security measures to prevent virus, adware, spyware and other threats for the internet. Provide on-site training for on-line claims submission. 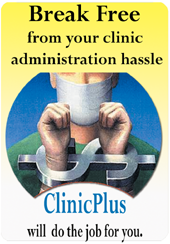 Please call us at 03-7877 2327 or email us @ info@clinicplus.com.my to set an appointment to discuss further. It would be our pleasure to demonstrate our capabilities and show you how the unique services would benefit you as Medical Service Providers. You will immediately see the advantages.